For fans of elves, shapeshifters and elemental control. Zacriah Trovirn is concerned with two things in life: hunting and dodging Petrer, the boy who broke his heart. Heartbreak becomes a distant concern when Zacriah is taken to the Elven capital of Thessolina, where he is forced into King Dalior’s new legion of shapeshifters. But Zacriah isn’t a shapeshifter. In truth, he doesn’t know what he is. Zacriah joins forces with new friends and they soon find themselves embroiled in a clash between the three Elven continents. With war looming on the horizon, Zacriah must learn to use his latent power to fight and protect those he loves before they are destroyed. 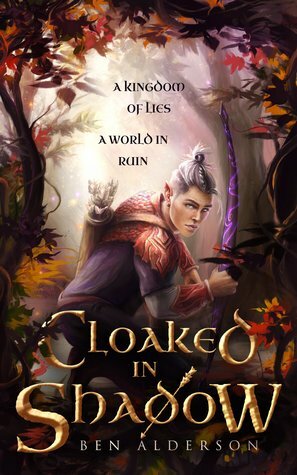 Cloaked in Shadow was a highly anticipated read for me. One, because I love Ben Alderson. He’s an amazing book blogger, I have so much admiration for the fact that he started his own publishing company and he just seems like an overall great guy. Two, have you seen that cover? It is absolutely gorgeous. Three, it was described as “Beauty and the Beast inspired fantasy with Dragons, Gay Romance and Elemental Control”. Take my money now, please! And overall, I did enjoy this book. It’s a fast-paced, magical fantasy that’ll easily sweep you away into the fantastical world Ben has created. I was hooked from the very first chapter and read the whole book in a matter of days. The pacing is fast and will easily keep you on the edge of your seat. The worldbuilding is intriguing and it is clear that this is only the beginning. This book is only an introduction to this world and the possibilities are still endless. I am already curious to see what the next books will bring, and yes, I definitely am already impatiently waiting to read them. I also highly enjoyed the LGBTQ+ themes in the book and how this was handled. To be more specific, how it is treated as the absolutely normal part of society it should be. Nobody looks at Zac any differently because he is gay. This was the author’s intent: for kids to read this book and see how normal being gay really is. And while sure, there also need to be books that show the difficulties and the homophobia that unfortunately still happens, it’s also refreshing to just be able to read a book where it’s the most normal thing in the world and I’m sure lots of kids will love seeing themselves represented like this. With that said, I unfortunately also have a few things about the book I loved a little less. Though I applaud Ben so, so much for writing his own book as this is a huge achievement and overall he did amazing, I did think that sometimes the writing was a bit lacking. There were a few plot points that didn’t make that much sense to me and just felt a bit unbelievable. The dialogue felt a bit stilted, especially the voice of the love interest for some reason, which caused me to highly distrust him from the beginning until the end, which I think was not the intention. Another character felt too much like your regular ‘mean girl trope’, and I was hoping for her to be a more dimensional character. Also, the ending was way too rushed and chaotic and had me incredibly confused. But I’m sure these are all things that can be improved upon by the next book and as such, I am still pretty excited to read more in this series, and to keep an eye on anything Ben writes next! HAVE YOU READ CLoaked in Shadow? WHAT DID YOU THINK ABOUT IT? Aww too bad it wasn’t the best book… I’ve been eyeing Cloaked in Shadow for a while. The cover is amazing so it’s sad the writing wasn’t great, which is something that’s really important for me in a book. Great review, though!! Sorry to hear this one didn’t work out better for you. The rushed and chaotic ending would have bothered me as well. I haven’t read it. To be honest, I didn’t even know about this one. Too bad it didn’t blow your mind but at least it was an okay read. Great review! Great review! I had been debating buying this one since I have liked everything Oftomes has published that I’ve read. Thanks! I hope you’ll love this one as much as the other Oftomes books!